(Bloomberg) -- As the share of Group-of-20 economic output controlled by populists and non-democratic regimes rises, there are increasing signs that bad policies are hurting growth. 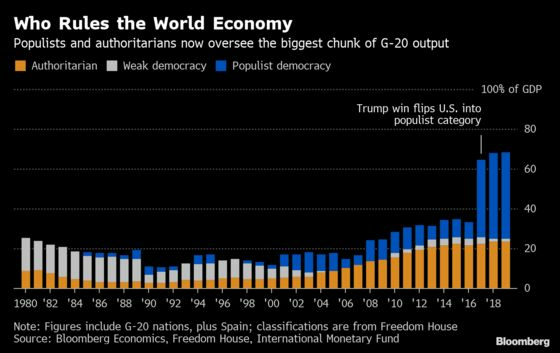 Based on Bloomberg Economics’ classification, 68 percent of G-20 GDP is under the governance of either populist rulers in democracies or non-democratic regimes -- that’s up from 65 percent in 2017 and a jump from 33 percent in 2016. A risk going forward: If global growth falls more sharply than BE anticipates, antagonistic and inward-looking leaders of major economies will be ill-placed to coordinate a response.